Looking for a way to extend your bottom time and come out of the dive fresh ? 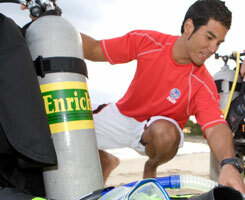 Join us at UBC Aqua Society and become a Enriched Air Diver! For example, if you dive to 15 metres/50 feet on air, your no decompression limit is 80 minutes. But, diving on EANx36 gets you 220 minutes of no decompression time – an increase of 140 minutes! It’s perfect for underwater photographers, wreck divers and anyone who wants to stay down longer.